Sometimes couples find themselves with the wrong help. Someone who doesn't have their best interest at heart and doesn't know how to help them heal. Sometimes even pastors are misguided and unhelpful. Read our response to this podcast listener's question. Part Two: GET A LIFE The 3 step process we talked about in the last newsletter 1. Stop the Chase, 2. Get a Life, and 3. Wait & Watch is going to save you from becoming a statistic. We talked about when your spouse is leaving or has already left and how most people pursue, reason, chase, beg, plead, and implore the other the stay when they are faced with this life altering moment. This is normal, however, so is divorce. We all know the staggering statistics about divorce in Oklahoma and how we rank number one in the nation when it comes to divorce. In this newsletter we will talk more about stopping the chase and getting a life. 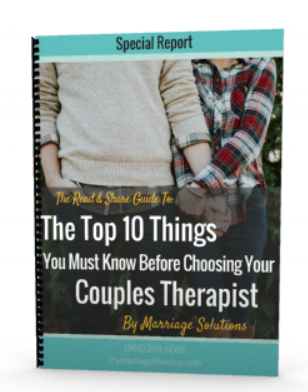 Sticking to this process can make or break your marriage at this point so it is very important to stick with it even though it is hard and could be the hardest point in your entire life. After you have decided to divorce or separate, tell your kids before you act on it. Both of you should be present and plan what you will say to all of your kids at one time. Children will have many questions about living arrangements, holidays, school, activities, new parents, pets, and friends. Know ahead of time what some of these questions might be and have your response ready. You can help ease your children’s anxiety by giving them answers to their questions. Grandparents can offer your children a form of support and stability that has been proven to be a major factor in helping children cope with the effects of divorce. Keep grandparents in the loop and ask them for their help during this difficult time. Have some familiar items in a bedroom in each home to offer kids comfort and security. Also, have a space for older kids to place their school books, athletic gear, or musical instruments. 5. Remember marriage counseling can help you avoid divorcing and help you rebuild your marriage. Coping With Divorce Or Separation? 4th Sign that Divorce is Near! The fourth and final sign that the end is near in your marriage is STONEWALLING. Note: The end is only near if there is no intervention like marriage counseling. This simply means the listener withdraws from the interaction while staying in the room. Basically this means not giving cues that he or she is listening i.e. by looking at the side and not maintaining eye contact or crossing one's arms. This is very common in men. Solution? Use PHYSIOLOGICAL SELF-SOOTHING, meaning learn to calm yourself down. Usually when someone is stonewalling their heart beat is close to 100 beats per minute. When your heart beat gets that high your adrenaline is pumping and you are in survival mode because you are being verbally beat up. The key to self-soothing is to use relaxation techniques like deep breathing or tightening and relaxing muscles in your body. Marriage counseling can help your marriage. Do You Have The 3rd Sign that Divorce is Near In Your Relationship? This is sign to end all signs, this warning sign is so bad that marriage researchers just by spotting this warning sign can predict divorce with 94% accuracy. The end is only near if there is no intervention like marriage counseling. To be contemptuous is to put someone down, and to take a higher plan i.e. taking a higher moral ground. It's a position that says, "I am better, smarter, kinder/etc than you are." It can be accompanied by a belligerent attitude. When contempt is present in a relationship it is accompanied by a negative habit of mind where the wife scans the environment for her husbands mistakes rather than for what is positive or what she can appreciate. Now there is a cross-cultural universal facial expression of contempt: a lateral pull of the left lip corner to the side creating a dimple on the left side. Create a CULTURE OF APPRECIATION! Be thankful! Key ways to do this is to communicate to your partner what you like and love about them on a regular basis. It is more meaningful when it is done unexpectedly and in small ways, but done everyday. Let them know you are thankful for: being with them, knowing them, and what they do for you. Remember marriage counseling can help you avoid divorcing and help you rebuild your marriage. The next sign that you maybe in a troubled marriage is DEFENSIVENESS. The end is only near if there is no intervention like marriage counseling. Defensiveness follows criticism in the dysfunctional pattern of marital communication. What causes someone to feel defensive in a marital discussion is being criticized by their partner. When someone is criticized they are not thinking about what role they had in creating a problem but they are naturally thinking about how they are right and the criticizer is wrong. So defensiveness actually results in the defensive partner to criticize to show how "right" they are. It creates more criticism and causes nothing to be resolved in your marriage. When you are criticized accepted responsibility for your part in the situation, even if it is a minor role. If you don't the cycle of criticism and defensiveness will play out in your marriage and cause you to grow apart. Marriage counseling can help your marriage.